The Vertex is an entry level potentiostat/galvanostat with optional FRA/EIS and optional I/O port. Its price easily matches its application in educational and applied electrochemistry. A complete suite of IviumSoft control and data processing software is included as standard (for Windows based PCs). 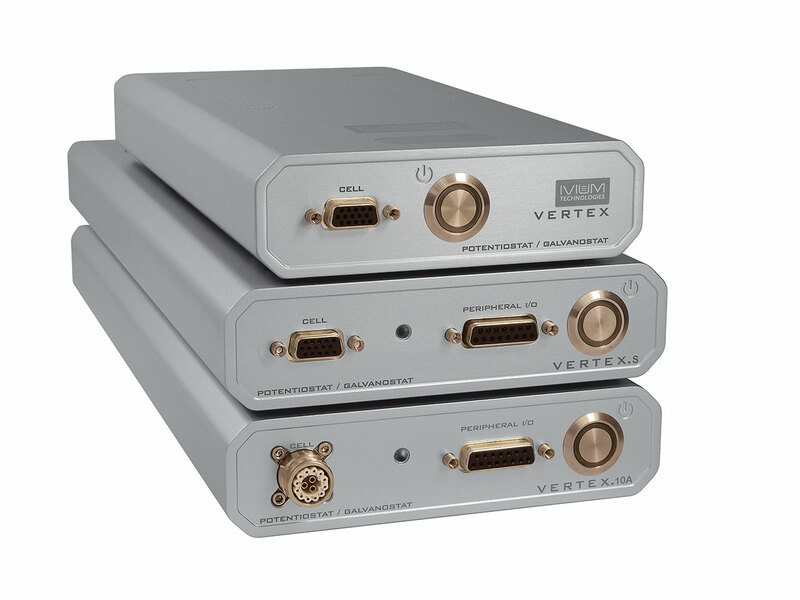 The Vertex can optionally be expanded with a True Linear Scan module and/or FRA/EIS capability. Next to that the Vertex is compatible with other Ivium options & modules, such as the HiMUX and CIM, and several Ivium boosters for higher power requirements. The Vertex is controlled via Ivium’s own IviumSoft. This versatile, yet intuitive software allows instrument control, data management and analysis, peripheral instrument control, etc. IviumSoft can also interface with and be controlled from LabVIEWTM, C++, Delphi, etc. A full suite of IviumSoft is included as standard with each instrument. ±0.5V sinewave, 10µHz-1MHz with var. att.